UPDATE OCTOBER 30, 2007: www.snopes.com reports that the puppies have been adopted. 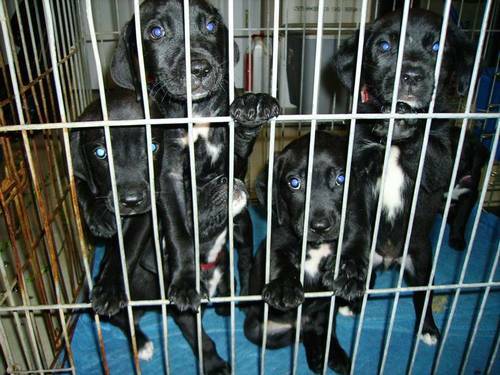 From a client and friend: "A friend of mine rescued 6 black lab (mix) puppies out of the middle of the road on Saturday. PLEASE help find them homes - otherwise, it's Animal Control - which means they only have 5 days. They’ve been bathed, sprayed for fleas and wormed....but they can't keep them.. They are currently in a kennel in their basement since they don't have a fence. They’ve contacted numerous rescue groups but have been turned down due to limited space. " Their life in Cairo would be too rough, I'm afraid. Oh my, after a year of being cranky about a dog, I find myself seriously wanting one of these puppies! Alas, I live in another state and in a no-dog or puppy apartment complex--but yikes they are cute. I hope someone adopts them. omg, those dogs look just like quimby!! millions of quimbies! i want them all. but also, quimby doesn't really like other dogs.